Looking back at our blog post from last November we introduced a new series of stills taken in Memphis, TN at the infamous locale, Earnestine & Hazel's. We are proud to announce the second half of the project; a motion companion piece. We were introduced to Earnestine & Hazel's during a previous visit to Memphis and within minutes of crossing the threshold knew this was a place to keep in mind for a future shoot. Like many of our personal projects, a simple idea, a subject or two, and an interesting backdrop are often all that's needed to create interesting visuals as well as help in the refinement of our craft. This is one of the first motion shoots where most of the footage was shot in a handheld fashion, more in the vein of our still work. We also experimented with the refraction or shaping of light by holding small translucent items in front of the lens. It's hard to predict the outcome, but in some instances it added an additional layer of interest. The post / finishing work came together in collaboration with Minneapolis based Eric Schleicher "FilmerKid." We are always working to experiment with both shooting and editing. Eric brought a fresh approach to our motion clips, blending many of the subjects and scenes in a way that seemed almost natural to what we had shot. The music track "Wait for me" was sourced from Moby Gratis: a site inspired by variations of existing and unreleased tracks by Moby for use in personal projects. This site has intrigued us for quite some time and has always been in the back of our minds as a possibility for an upcoming test or personal motion project. The Earnestine and Hazels project seemed a likely candidate for a song by the electronic music legend. After several plays it's uncanny how well the pacing of the visuals meld with the music and vice-versa. The opening title graphics and ending credits were designed by Minneapolis based graphic designer Laura Foster. We are quite pleased with how it all came together and invite you to experience Earnestine & Hazel's - Wait For Me. This past month we have begun shooting on both of Canon's latest cameras- the C300 and the 5DMark III. We look forward to sharing what we've been working on and are excited with the innovations in both capture and workflow that have evolved. From an early age we are learning from each other and our environment; a life long process that never stops. As with any project, we are always gaining new knowledge and furthering our professional education in the field. How fitting it was that our final shoot of the 2011 calendar year was for Capella University, an institution here in downtown Minneapolis focused on formal higher education. We spent the better part of two days crafting images for their online and print collateral within an actual school we sourced as our base for the shoot location. With the addition of talent, both adults and children, the environment quickly took shape as a living, breathing school setting. The interaction between teachers and students couldn't have been better to create a little slice of the education process allowing us to capture some truly great "Aha!" moments. The two days flew by and we walked away with new knowledge, and a great library of images. In our ever increasing world of advanced technology, we have become more and more intrigued by non-digitally based techniques and trades. In the same vein as the JCP Newsprint promo, we have been exploring the idea of creating a few short run promotional items that allow for collaboration with local artisans and craftsmen here in the greater Minneapolis area. Our search along this path led us to a small shop rooted in the Northeast side of town called Angel Bomb Design & Letterpress. Todd Thyberg, the owner and operator of Angel Bomb showed us around his warehouse based work space and introduced us to the Heidelberg letterpress machine. This press dates back to the first half of the 20th century and has been a workhorse of German engineering ever since its inception. As a designer, Todd has been working in the industry for the past 15 years and made his way into the world of letterpress about 5 years ago with a press given to him by his father. He's always been a fan of this historic printing process and explained to us that it's about "making something with your hands." In a time when our lives are increasingly becoming "digitally consumed" there is something "refreshing" about taking time away from the computer screen and using a different part of our brains to problem solve, get our hands dirty, and create something tactile that appeals to several of our senses and is ultimately "made by hand." He went on to comment that there seems to be a shift in society towards a return to the things we once produced in an artisan or craft manner. During our time with Todd, we discussed having a set of limited run beverage coasters produced on the Heidelberg. In 2011 we partnered with Eight Hour Day to refresh the JCP brand. Minneapolis based Jason Braun worked with these new JCP design elements to concept the design and look of the coasters. It only seemed appropriate to document the experience of our day "on press." It was great spending time with Todd, and seeing the Heidelberg in action as our coasters came to life. We hope you will enjoy a small visual slice of the operation including an exclusive audio clip of the press in action. In the world of decking there are a variety of options for choosing the materials to be used for construction. Perennial Wood is the latest addition from the Eastman Company which is sure to be a game changer. The Perennial line will have all the attributes of real wood without all the natural pitfalls that can potentially create problems for the owner down the road. The idea behind it is to have a great looking product that will ensure years of use and beauty in spite of aging, weather conditions, and everyday use by the owners. Shine Advertising brought us on for this collaboration, under the art direction of Audelino Moreno. Over a period of two days last summer we worked in a remote location north of Minneapolis to photograph one of the first decks made from this new product. The goal was to capture beauty shots of the deck with and without people in various forms of activity or rest depending upon the scene. The product release is slated for the first quarter of 2012 with availability through various retailers in the northeastern part of the U.S. The print ads above are currently running in northeastern markets in such publications as Real Simple, Martha Stewart Living, Better Homes & Gardens, Country Living and more. 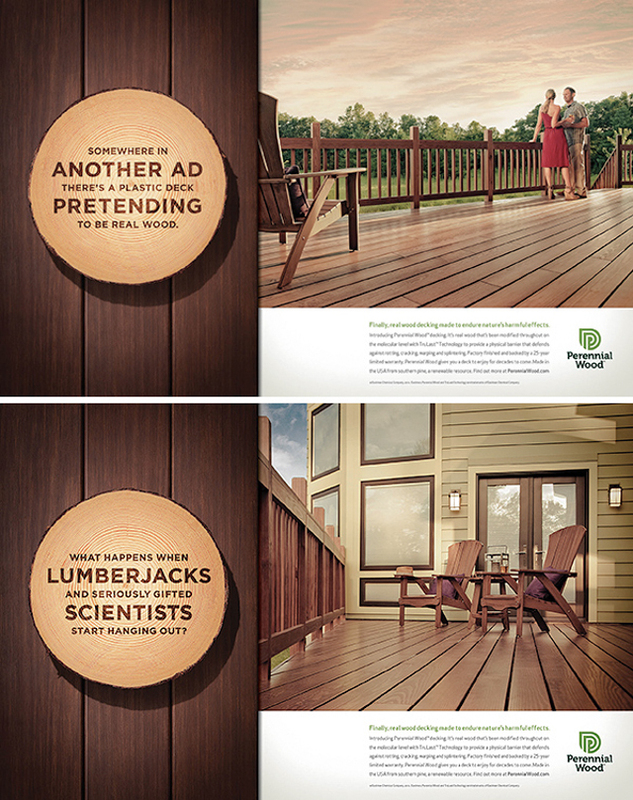 In addition to the print ads above, a brochure was created for the home improvement retailer Lowe's who will be carrying the Perennial Line of decking.